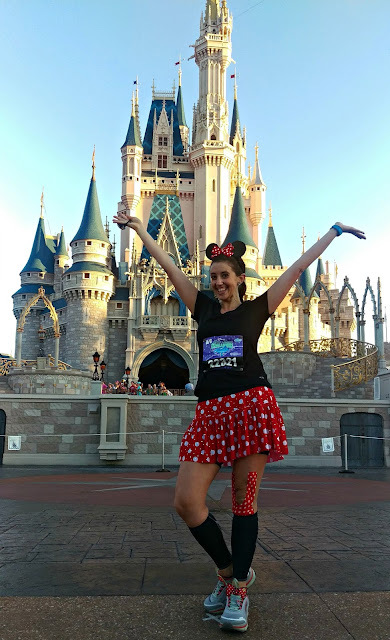 This post recaps the second part of my Disney Princess Weekend. Find Part I (expo and 10k) here! 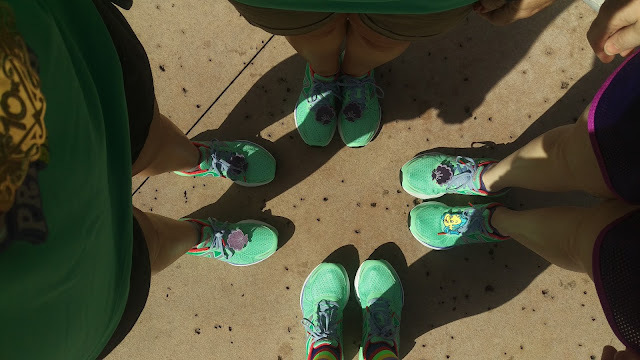 When we left off in the magical recap of Disney Princess Half Marathon Weekend, Jen and I were headed to Downtown Disney Springs to do some shopping and then meet up with friends at the We Run Social meet-up. A little after one, we headed over to the carousel for the We Run Social Meet-Up. In a nutshell, we hung out, won some prizes, and took some awesome selfies. I finally got to meet Dani, got to chat with Gelcys, and got to see some of my running ohana! After the meet-up, a few of us grabbed some beers and sat around telling funny wedding and running stories and laughing our asses off all afternoon. We eventually went back to Art of Animation to relax and get our gear and costumes ready for the half marathon. I talked to Matthew around six and we said our goodnights then because he told me his phone was dying (more on this little fact later). Going to bed that night, I was super worried about my knee. 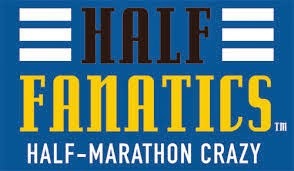 It had been bothering me all day and I wondered if I would be able to make it through the half the next day. I barely slept, tossing and turning all night. When our alarms went off at 3:00 am, I seriously questioned what I was doing and how in the hell I was going to get through 13.1 miles on a bum knee. Anyway, we both got up and got ready for the race. We met Nathan at the bus stop (he stayed the night at AoA) and got on a bus around 3:50 am. 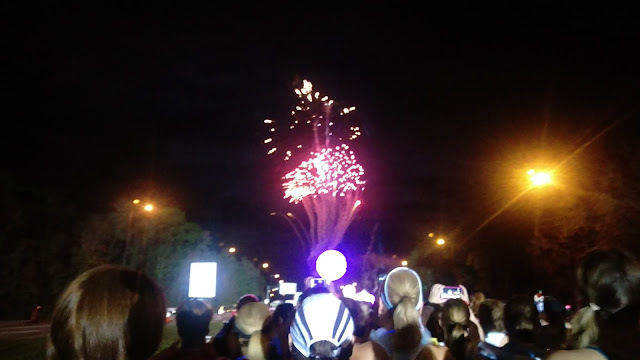 Since we got on a later bus, there was a little bit of traffic getting to the race start at Epcot. We got there around 4:25 and I asked Nathan to text our ohana to let them know we were running late to our "regular" meet-up spot; right next to the first bag check tent. Once we got off the bus, Nathan kept texting someone and I assumed it was Lauren or someone else in our ohana. I mean, who else could he be texting repeatedly at 4:30 in the morning?! We eventually found our group and exchanged hugs and good luck messages to each other. 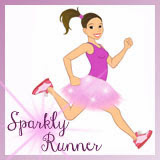 All of the sudden, someone came up behind me and said, "is that Sparkly Runner?" It was Matthew!!! I was in shock! I think I said, "What are you doing here?!" followed by "Who's taking care of the dog?!" 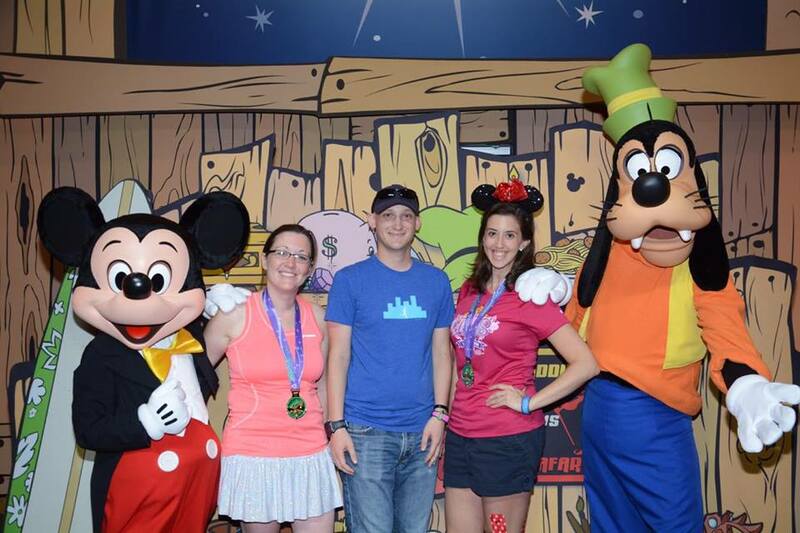 He quickly explained that when his phone was "dead" the night before, he was actually flying to Orlando, renting a car, spending the night in the parking lots of Disney Springs and Epcot, and coordinating/texting with Nathan all morning to find out where we were just so he could watch me and Jen run the half- does it get any sweeter than this?! Seriously, I am the luckiest woman in the world and cannot believe that I get to call him my husband in just a few short months! After getting over the shock of seeing Matthew and then discussing his spectating plans, we made our way back to the corrals. Jen was supposed to be in F but she hung back and went into G with me. It was awesome to be on "this side" of the road when we walked to the corrals. It was insane how close we felt to the start line! I've never started in a corral that low before. For Dopey, we were all the way back in L.
The start of corral A from the viewpoint of corral G.
Before we knew it, it was time for us to race! 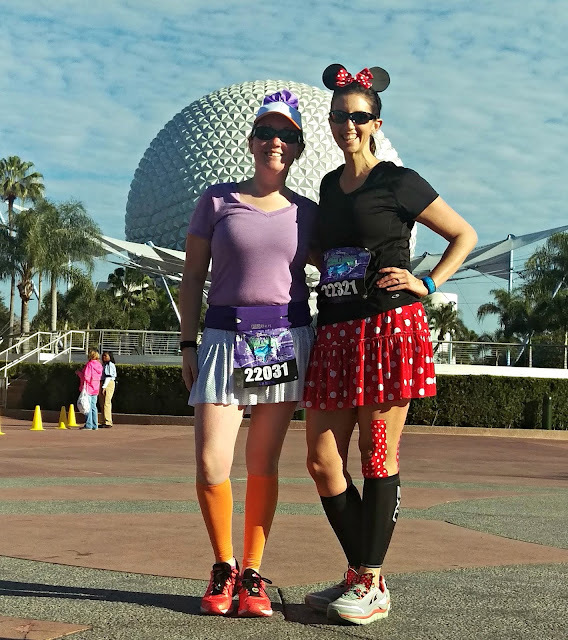 Our plan was to just take in all 13.1 magical miles, enjoy the race, and finish upright and smiling. We stuck to the intervals that we'd used the day before, 30 seconds running, 30 seconds walking. 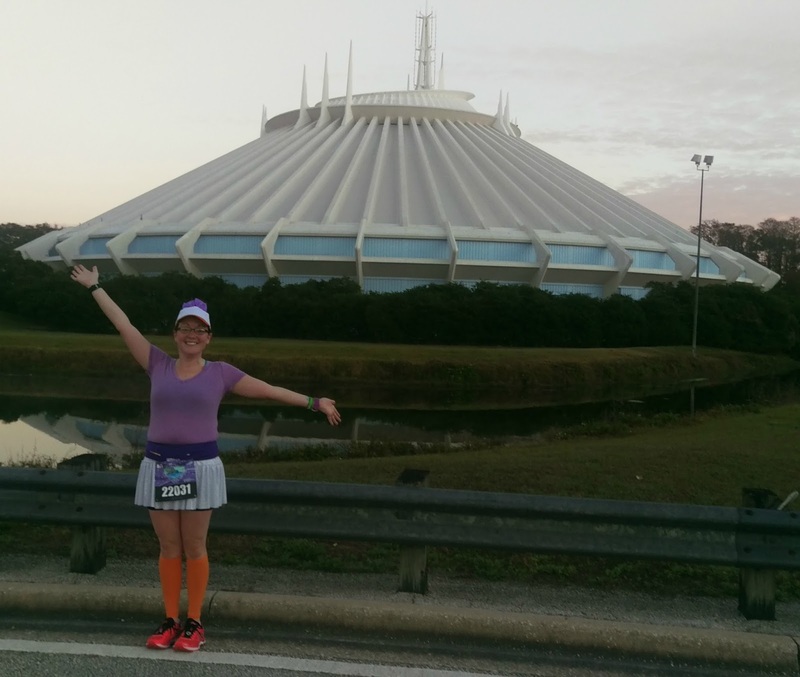 Since I'd done this race before, I knew we'd run about 4.5 miles to Magic Kingdom, spend about a mile in and around the park, then finish the race on the highways as we made our way back to Epcot. 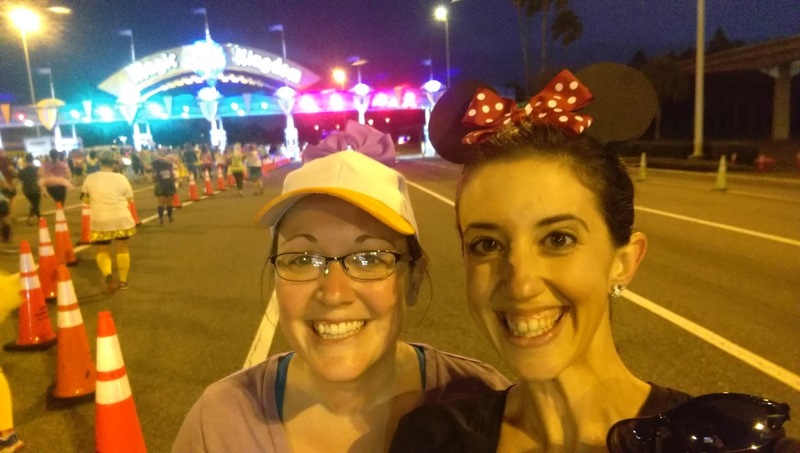 After a three highway miles, we ran under the Magic Kingdom sign. Even though we still had a few miles to go before we got to the castle, it was still exciting to be so close! Also, we knew Matthew and Nathan would be at the Ticket and Transportation Center (TTC) at the mile 4 marker so we had something to look forward to before we got to the castle. 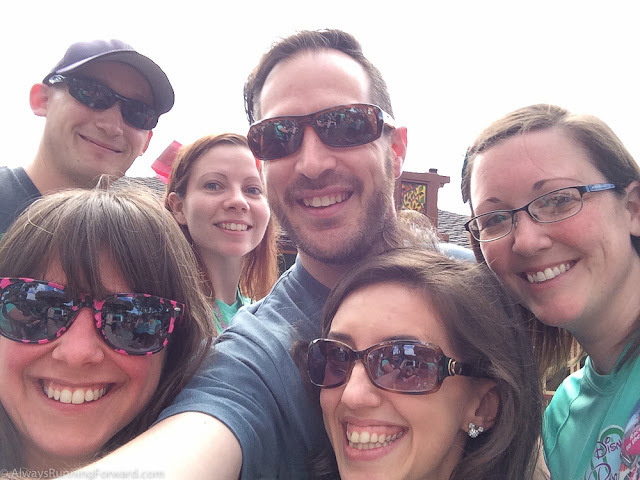 All smiles as we head toward Cinderella's Castle! We ran toward the TTC, taking breaks when we needed to and taking lots and lots of pictures. My friend Bill, an Orlando native, had tweeted at me to let me know that he was also at the TTC, cheering for runners. As we came into the TTC, we kept our eyes peeled for Bill and Matthew/Nathan. Even though it was super crowded with spectators, we were able to see them both. I can't tell you how awesome it is to see familiar faces (especially my hubby-to-be!) out cheering for you. Bill grabbed a quick picture and then Jen grabbed a quick shot of me and Matthew.Then we were on our way to Main Street, USA! Action shot, courtesy of Bill. We kept running towards MK. We enter the side of Main Street so we actually entered the park near Space Mountain. Because we had started relatively early in the race, there was not any crowding on the course. In the picture below, it looks like Jen and I have the course to ourselves! After hearing how crowded this race usually is, it was a pleasant surprise to not feel overwhelmed with people. After we passed Space Mountain, we were finally on Main Street, USA. 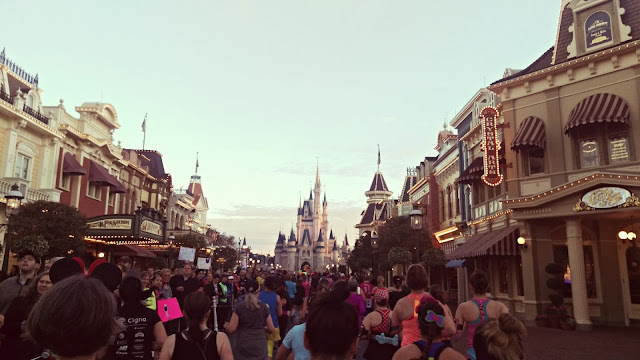 I won't lie, I definitely teared up when we turned onto Main Street- hundreds of people cheering and clapping, Disney music playing through the speakers, and the beautiful sight of Cinderella's castle off in the distance. This, my friends, is pure Disney magic. We ran up Main Street, stopping for lots of selfies, and then turned right into Tomorrowland. We made a quick pit stop off-course at my favorite bathroom to use during races- the one in Fantasyland by Pinocchio's Pizza- it's never crowded. Then we got to actually run through the castle, which was just as magical as I remember it being :-) Usually, this is insanely crowded and it takes forever to get through the castle due to the bottleneck of everyone trying to get their picture taken in front of the castle. 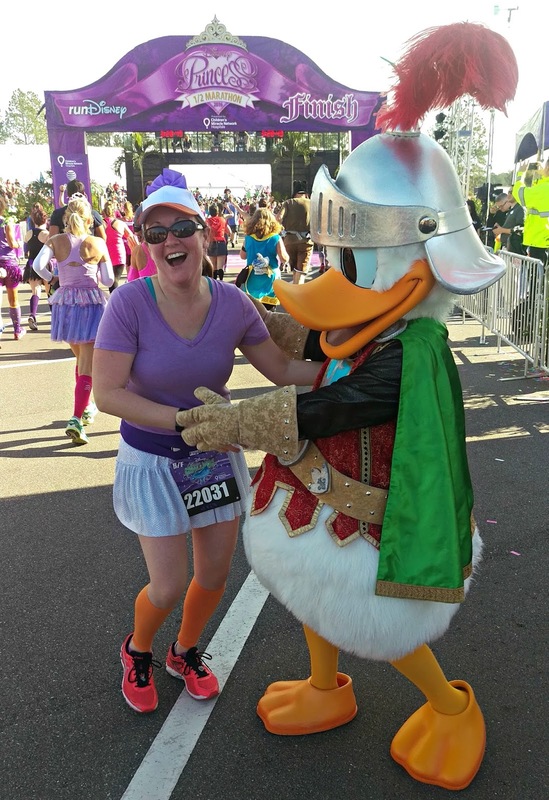 In fact, Matthew and I have never stopped in front of the castle during a runDisney race because it's such a cluster. But, this time, it was awesome! There were five photographers at the front of the castle so there was only a few minutes wait to get the famed castle shot. While we were waiting, a blog reader called out to me- she was behind me in line. I didn't catch her name but we wished each other well and then Jen and I headed off on the next part of the course. Jen and I made our way out of the park :-( and back out onto the highway. We had planned on meeting Matthew and Nathan around mile seven to swap out Jen's glasses for sunglasses. 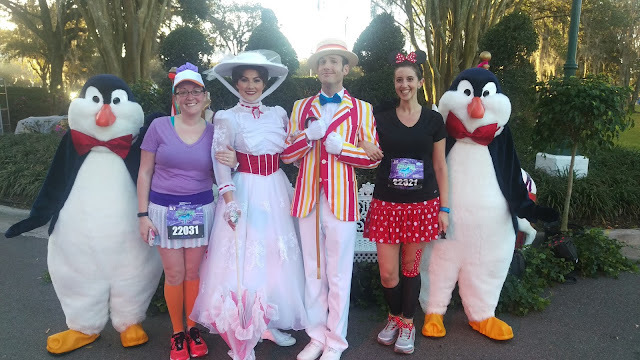 On our way to mile seven, we saw a very short line for Mary Poppins, Burt, and some penguins so we stopped for a picture. I think this was the first character stop we'd made during the whole race- most of the lines were pretty long. We met up with Matthew and Nathan and made a successful glasses switch! Matthew told us where he'd see us next (mile 12) and then we continued on to finish out the race. 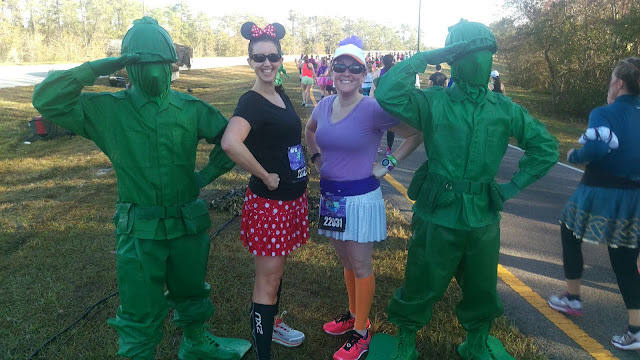 Around mile eight, we gladly took candy and pretzels from strangers and then around mile 11, we stopped for a quick picture with the army men from Toy Story. 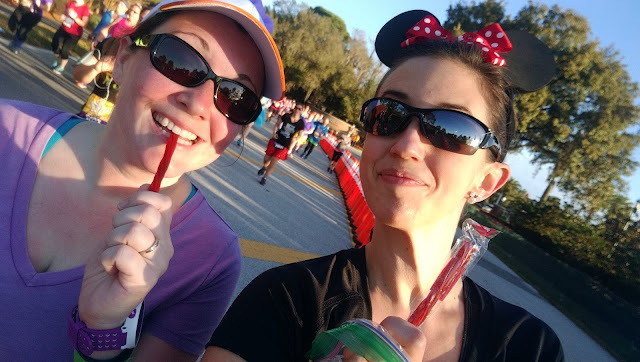 Twizzlers are the greatest race treat ever. We met up with Matthew one more time and then looped our way through Futureworld in Epcot, stopping once for a picture with Spaceship Earth before heading back toward the finish. We passed the amazing gospel choir that marked the last little bit of our magical 13.1 mile journey and then we finally saw it- the finish line! And then- even better- we saw Donald! Since Jen was dressed as Daisy, we just had to get a picture with him. 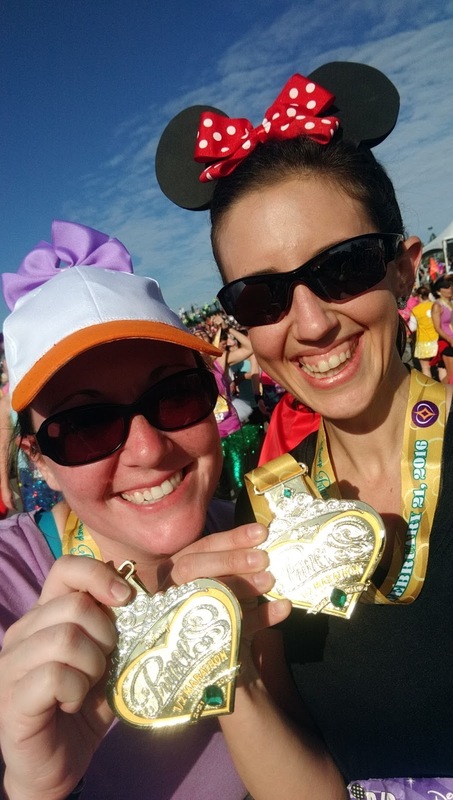 Hugs acquired; we crossed the line and became Glass Slipper Challenge finishers! 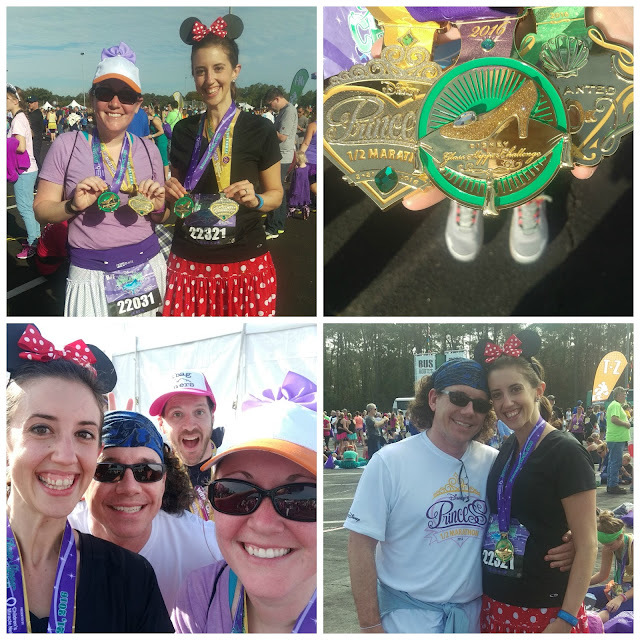 We got our medals, grabbed some Gatorade and water, and then headed through the "challenge tent" to pick up our Glass Slipper medals. 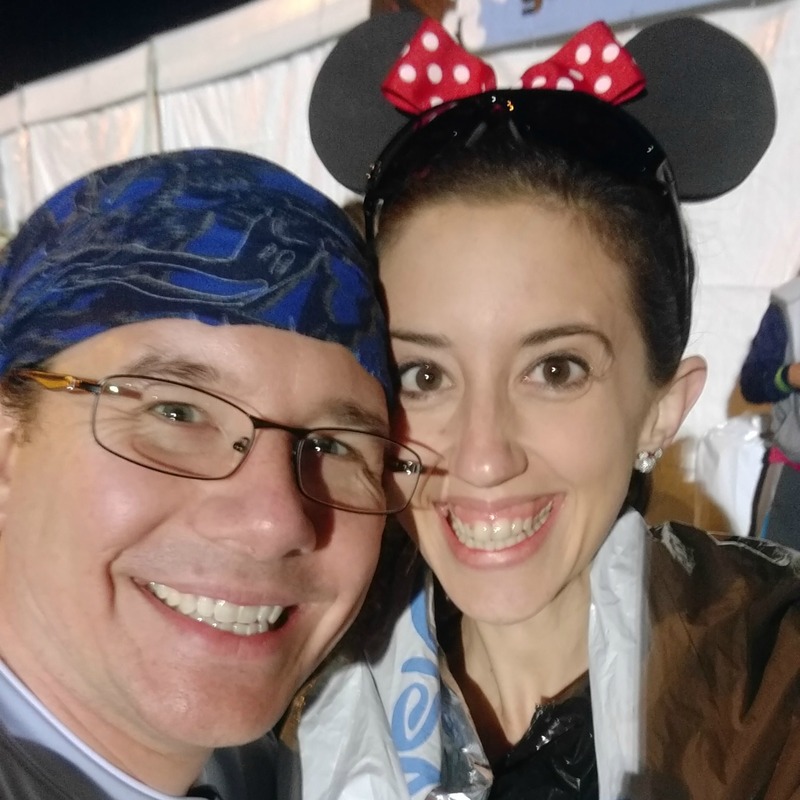 They'd taken a picture of us when we picked up our bibs at the expo and the race officials checked this picture against us when we walked through the tent and then gave us our medals. Eventually, we got up and started making our way towards the parking lot to see Matthew off. We visited the merchandise tent and I bought an "I Did It!" shirt for the half- mainly because these shirts have the course map on the back and this one had little tiara mile markers- so cute! Reluctantly we said our goodbyes to Matthew and then headed into Epcot. We drank beer in Germany, ate school bread in Norway, and got some pictures with Jasmine in Morocco. Nathan met up with us and we continued walking around World Showcase, just enjoying the park. Then we headed to MK to watch the 3 pm day parade (which is amazing, by the way!) 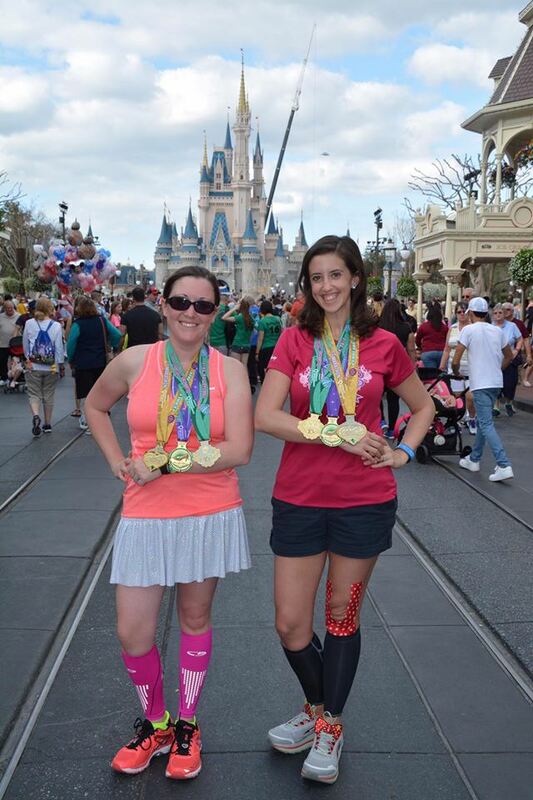 and get some bling shots in front of the castle. Jen and I had fast passes to rides in Hollywood Studios so we said goodbye to Nathan and headed to DHS for the evening. After dinner and roller coasters, we ended our night at MK with the Electric Light Parade and Wishes. We might have fallen asleep on the bus on the way back to Art of Animation :-) According to Jen's FitBit, we did over 25 miles on Sunday! Just hanging with some friends. Overall, this was a fantastic race weekend! Neither race was as crowded as I thought they would be, we got to meet/spend time with new and old friends, and Matthew flew over 1,000 miles to come watch the half marathon- that's more than enough reasons to put the "fantastic" label on a weekend! I really, really love this race weekend. There's just something about running a women's focused race that makes my heart incredibly happy. Also, this was my first half marathon four years ago so I might have a little nostalgia attached to it. Would I run Princess again? Yes, absolutely, 100%. 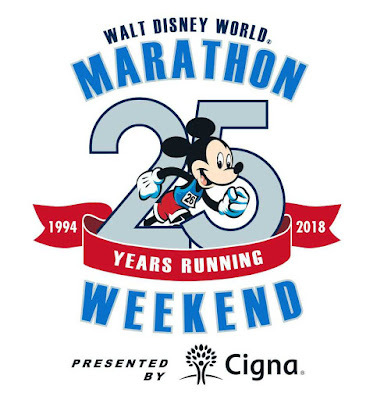 For as much as Disney races cost (plus flights, hotels, park tickets, etc. ), they are a one-of-a-kind experience. As I said earlier, running towards Cinderella's Castle down Main Street, USA is pure Disney magic. There's no other race that offers that perk. This makes me so incredibly excited for next year!! I also LOVE Matthew surprising you! Seriously, when do I get my fun race day surprise!?! 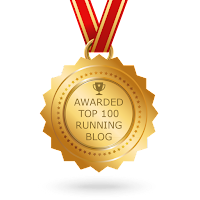 So...I posted on your 10k recap to tell you we were in the same corral. So we also stayed at the same hotel and I caught the bus around 3:45! We were seriously RIGHT THERE so many times lol. 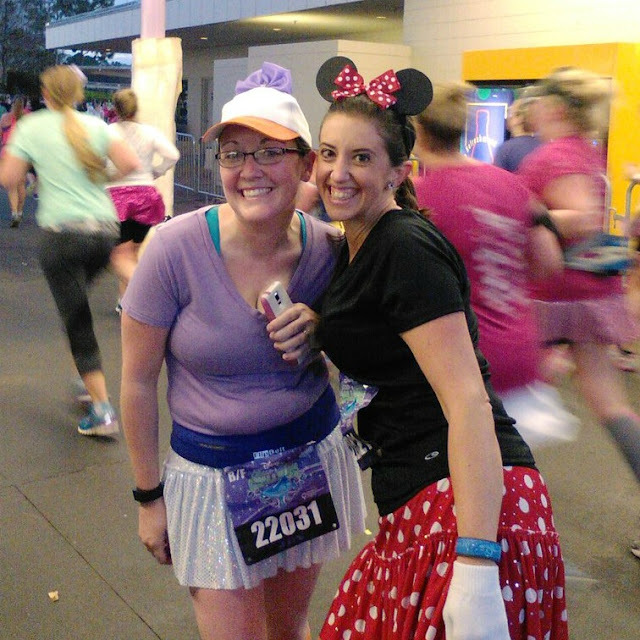 I was also supposed to be in corral G but stayed back with my friend in corral H. It really was a magical race weekend. 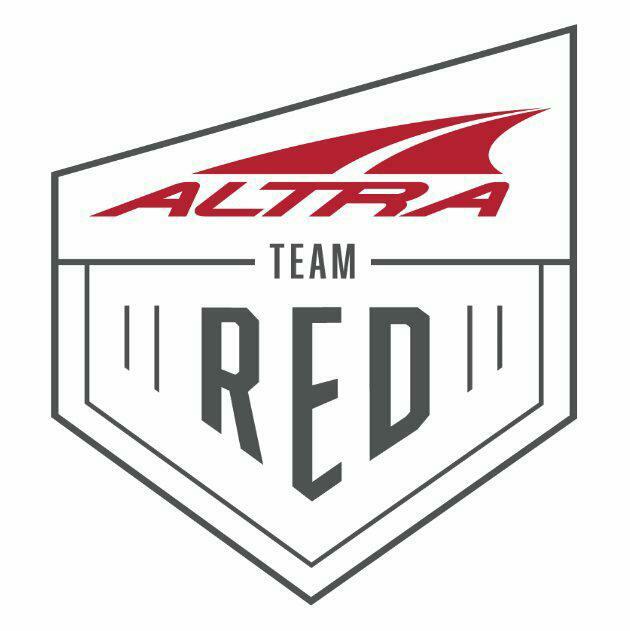 I loved every minute of the race. 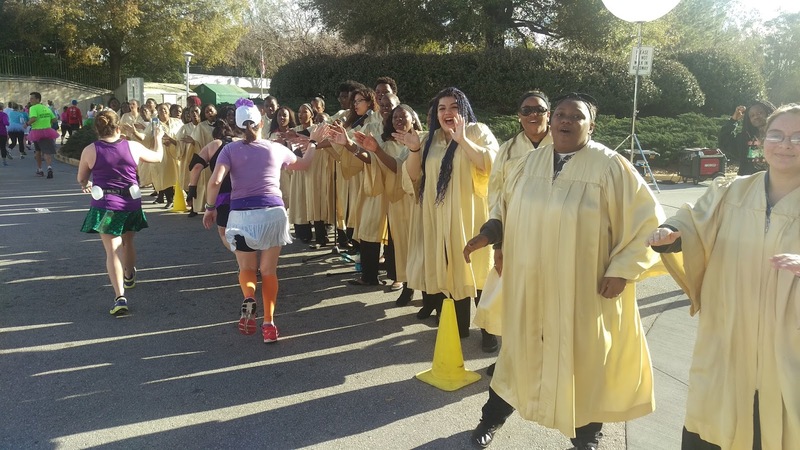 And you are right...high fiving the gospel choir is awesome! I'm so sorry we missed each other!!! Bummer!!! And yes, that gospel choir is just the BEST! I completed the GSC this year, too! It was my first Disney race and I can't wait to do another one! Loved reading your recap of the magical weekend. Congratulations! Aren't they just awesome?! Ah, this makes me want to run the Princess. 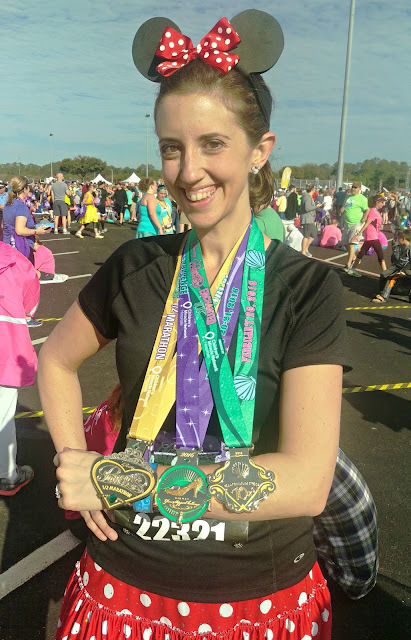 I've done the WDW Marathon weekend three times but never the Princess. Looks like a lot of fun. You should definitely try it. 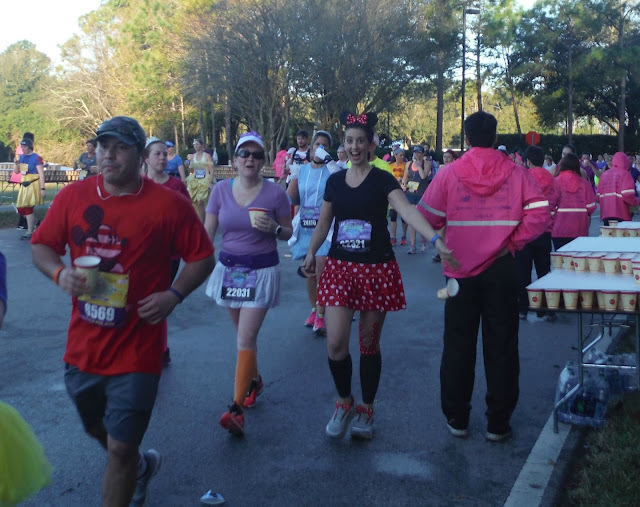 It's totally different than WDW- even though the course is the same, the energy surrounding the race is very different. No matter how many times i've run this race or how many other recaps I read, it always brings a smile to my face! I enjoyed your recap and glad you had a great time and that your knee held up! Kudos to Matthew for traveling to watch the race! Sweetest story ever! Princess is my favorite race weekend! This year the weather was awesome too. Matthew is so cute and sweet....what a keeper!